On May 25, President Donald Trump used his executive-order powers to restrict the activities of unions representing 2.1 million federal employees, in particular limiting drastically the on-the-job time that federal employees can devote to union activities. “This is more than union busting, it’s democracy busting,” stated AFGE President J. David Cox. Trade unionists across the country were outraged by this fundamental attack on union rights. They vowed to fight like hell to Dump Trump in 2020. But what about the Democrats; have they delivered on their promises of peace and prosperity for all? While the Democratic Party controlled Congress and a Democrat, Bill Clinton, was in the White House, anti-striker replacement legislation — the AFL-CIO’s top priority — passed the House twice but didn’t garner the 60 votes in the Senate to prevent a filibuster. The vote was very close, and it was acknowledged widely that the legislation would have passed had Clinton exerted pressure on a couple of Senators as he had done when it came to pushing through the anti-labor NAFTA trade agreement. The threat of hiring permanent replacements had been instrumental in breaking major labor actions, such as the Greyhound strike in 1990 and the Caterpillar strike in 1992. The same was true in 2008, when then-candidate Barack Obama promised the labor movement that his first priority would be to enact the Employee Free Choice Act (EFCA), only to sideline this effort once in office despite the fact that the Democrats controlled the presidency and both houses of Congress. EFCA would have removed many of the huge hurdles to union organizing that had worked their way into labor law over many decades. The corporate-led drive to erode labor rights and unionization is fully bipartisan. The Democrats are funded and controlled by the same anti-union corporate interests that fund the Republicans. Following the May 20 election in Venezuela, there is an imminent threat of U.S. military intervention in that country, either directly or through proxy forces. This effort has full bipartisan support (see page 16). The heightened U.S. drive to war and occupations was given a big boost last year when the Democrats added billions more in war funding to the federal budget than Trump had requested. Ever since the 1990s, the war on Black America has escalated with increasing mass incarceration and militarization of police across the country — also a fully bipartisan offensive (see articles on the “daily slaughter of Black America” on page 8 and on the “American Gulag” on page 9). The fight for Medicare For All — that is, Single Payer — has been continually stymied by the Democrats, who give lip-service support while undermining it behind the scenes. Single Payer Now organizer Don Bechler exposes this duplicity on pages 7 and10. More and more immigrants are being gunned down as they attempt to cross the U.S.-Mexico border, fleeing from wars and poverty fueled by U.S. corporate-driven “free trade” agreements. In New Mexico, activists gathered at the border to protest two border patrol killings and to demand that the Wall of Shame be torn down. The Wall has been built and expanded with overwhelming bipartisan support. Obama deported more than 3 million undocumented immigrants, earning him the moniker of “Deporter-in-Chief” (see article on page 11). Some union leaders and community activists argue that it is not realistic or viable to propose any serious campaign for independent working class political action at this time given that the U.S. labor movement is in retreat. We disagree. We believe that this retreat has been caused in large part by the labor movement’s continued subordination to the Democratic Party, and that so long as those ties are not severed, labor will continue to decline. What are these proposed next steps? (1) Begin the formation of a Labor Party Advocates-type committee in the labor movement. Whatever its name, this committee’s goal would be to advance the discussion in the labor movement about the need to create a “Labor-Based Political Party” –— to quote the resolution on Independent Politics adopted by the October 2017 national convention of the AFL-CIO. In order to create a mass-based party of working people rooted in the unions and communities of the oppressed, we need to get the ball rolling in the labor movement; we need to raise the need for the unions to break with the Democratic Party. To initiate a new Labor Party advocacy group, every effort needs to be made to assemble a core group of labor leaders and activists who have spoken out about the need to build a Labor Party in this country, and who are committed to starting this effort now. Let us join forces to ensure that the resolution on Independent Politics adopted by the AFL-CIO is implemented, not shelved. Such a core group could organize forums across the country to begin assembling a broader list of supporters. Labor organizer Mark Dudzic told the forum at the AFL-CIO convention in St. Louis last October that, “building a new Labor-based party will be a long-range project and needs both community and labor support.” Okay, but it needs to start somewhere, and the time to get the ball rolling is now. Just look at the Democratic Party leadership’s “Talking Points” against Single Payer; they are straight out of the Republicans’ playbook. We cannot wait any longer to get the process started. The formation of the MPP, with its large number of supporters across the country, is a game-changer and should inspire labor folks to get on board. (2) Begin the process of forming committees (or coalitions) on a local level in cities across the country to run independent labor-community candidates in 2019 around a platform that embraces the workers’ and communities’ pressing demands, with the explicit aim of advancing the effort to build a new mass party of working people rooted in the unions and communities of the oppressed, with special attention given to reaching out to youth, especially youth of color. Given that local races are often non-partisan (that is, candidates do not have to declare any party affiliation), any independent labor-community candidate running for public office as part of this effort would need to call for breaking with the Democratic Party as well as for building a new mass independent political party of working people rooted in the unions and communities of the oppressed. That is the very definition of their political independence. After the May 29 Poor People’s Campaign action in Sacramento, Calif., a group of trade union and community activists, including top leaders of the Labor Council for Latin American Advancement (LCLAA – AFL-CIO), agreed to set up a Sacramento-wide committee with the aim of exploring the possibility of running independent labor-community candidates in 2019, as a step in the struggle to build a new independent mass political party. All were encouraged by the formation of the MPP and proposed organizing a forum in Sacramento with leaders of the MPP and Labor Fightback Network, among others. Such forums could be organized in cities across the country to build coalitions for independent labor-community candidates. The platforms of these independent candidates need to be discussed and approved by the labor-community coalitions, and the candidates must be answerable to such coalitions. This is an essential component of the effort to build working class power. Also the candidates and the coalitions themselves cannot be limited to electoral politics; they must be fighting for the issues contained in the platforms, projecting these struggles into the electoral arena. This will help to cement the alliance between labor and oppressed communities. If the effort to get an LPA-type committee off the ground succeeds, more local unions are likely to endorse and campaign for the local candidates. Building successful coalitions to promote independent labor-community candidates at a local level also could help gain new supporters at all levels of the labor movement to the LPA-type effort. Building locally and gaining national labor support are two prongs of an approach meant to feed off each other and advance our overall goals. A final word about labor’s alliances with Black and Latino communities: The labor component of these coalitions needs to be sensitive to the fact, especially within the Black community, that a number of Black organizations, including the Ujima Peoples Progress Party in Baltimore, have been running independent Black working class candidates for office, with some success. Labor should support such efforts as well as seeking to involve them in broader labor-community coalitions for a new mass party. Many of our readers rallied at state Capitols across the country on Tuesday, May 29, in opposition to militarism and the war economy, as they have been rallying at the other Poor People’s Campaign (PPC) actions as part of its six-week “Moral Revival” campaign. We were there as well. We salute the PPC’s effort to place vital issues such as racism, poverty, voting rights, just immigration, economic justice, living wages, universal healthcare, and more, at the center of the nation’s attention. These issues are urgent. Fifty years after the Poor People’s March on Washington, DC, not only have things not gotten better for the working-class majority and the oppressed communities, things have gotten dramatically worse [see the PPC fact sheet in the March 2018 issue of The Organizer]. Why is this? In our view, it’s not because the country has somehow lost its moral compass. It’s because we are living under a capitalist system in crisis — a system that only knows how to stem its growing crisis by fueling speculation and war spending, on the one hand, and by slashing workers’ wages and working/living conditions, on the other — for which they must promote divisions among workers and all the oppressed to prevent us from uniting and fighting back against their predatory system. We’re in this dire situation because the capitalists have been able to count on their twin parties — the Democrats and Republicans — to do their bidding. That is why any protests against poverty or racism that don’t challenge the root causes — however valiant and morally righteous their effort — can help motivate people toward greater empathy and activism, but, ultimately, will be unable to turn things around for workers and the dispossessed. To beat back this racist and anti-worker offensive by the bosses and the politicians in their pay, we need more than themes and a change of narrative. Above all, we need to put an end to the monopoly of political power by the Democrats and Republicans. The labor movement and the leaders of the Latino and Black struggles need to end their reliance on the Democratic Party and take steps toward building their own mass-based independent working class political party — a Labor Party based on the unions and rooted in the struggles of all the oppressed communities. At a time when close to two-thirds of the voting-age population favors the formation of a mass-based independent political party (recent Gallup poll), the time is now to get the ball rolling. This is not pie in the sky. Already independent candidates have come forward (like Gayle McLaughlin for Lt. Governor of California), and new independent formations are springing up (like the Movement for a People’s Party, breaking away from Bernie’s “Our Revolution”). Join us in discussing how we can initiate a process that will allow us to develop a slate of independent labor-community candidates for office in the 2019 elections, as part of the effort to launch a new labor-based political party. Send your comments on these proposals to Unity & Independence — the Special Section in The Organizer newspaper devoted to discussing how to advance the struggle for independent working class political action. A Massive Jobs-Creation Program – End All U.S. Wars and Occupations! We need to rebuild our ailing infrastructure, including our roads, bridges, levees, schools, and hospitals. The trillions spent on the U.S. wars and occupations around the world should be used to create a federal jobs-creation program with union-scale wages, benefits and pensions. The trillions should be spent on education, healthcare, and housing! Shut down all U.S. military bases overseas! Bring all U.S. troops home now! All workers deserve a living wage that lifts families out of poverty and provides a decent life. All workers deserve the peace of mind that comes with a safe job free from toxins and dangerous working conditions. Tax the Rich, Confiscate All Speculative Funds! Repeal the Trump tax hold-up and giveaway to the 1%. Make the rich pay their fair share to fund socially necessary services and job-creation. Re-regulate Wall Street, and confiscate all Wall Street speculative funds! Promote Workers’ Right to Unionize, Stop and Reverse All Privatizations! Stop and reverse all “Right to Work” (for less) laws. Stop the layoffs. “Taft Hartley” and “striker replacement” laws that hurt workers must be repealed. We need the Employee Free Choice Act and full collective-bargaining rights for public employees. Stop and reverse all privatization and deregulation schemes of schools, the post office, transit and other public services; all are aimed at lowering wages and eliminating unions. Return them to public ownership. For Single Payer healthcare now; take the insurance companies and their profits out of the healthcare equation. Hands Off Medicaid and Medicare. Strengthen and improve Social Security and Medicare! Gentrification is expanding everywhere; no working class residents should be driven from their homes by banking/ mortgage predators, real estate speculators or by hard economic times! Free and Quality Education, Stop Charter Schools and Vouchers! The cost of pre-school and higher education falls heaviest on working families, denying full opportunity to young workers. Free and quality education should be a basic human right from kindergarten through College. The “No Child Left Behind” Act (now the Every Student Succeeds Act) stifles learning, does not prepare students for higher education, is aimed at privatizing schools, and funnels students to the military. It should be repealed. Stop all funding for Charter Schools. Stop Vouchers! A National Energy/Mass Transit System! For the nationalization of oil, gas and other energy companies to end the manipulation of energy markets and to combat global warming. We need mass transportation systems affordable to the people; retool Detroit to build high-speed trains! Civil Rights and Privacy Protection! End workplace harassment and discrimination against union activists, unorganized, immigrant and injured workers. Repeal the so-called “Patriot Acts” and other laws that destroy our civil liberties. Defend Women’s Rights! End Sexual Harassment & Violence, End Anti-LGBTQ Bigotry! Guarantee access to contraception and abortion for all women. Reverse all restrictions on abortion rights. Stop the attacks on Planned Parenthood. Stop all forms of discrimination in the workplace and all sexual harassment and violence against women on and off the job. End all anti-LGBTQ bigotry! End Police Violence, For Civilian Review Boards with “Teeth”! We must put a stop to the epidemic of police violence and killings. Killer cops must be brought to justice. We need Civilian Review Boards with the power to hire and fire. Free Mumia and all political prisoners! Repeal All “Free Trade” Agreements! Trade treaties like NAFTA and CAFTA, backed by the two parties of the bosses, are designed to depress wages and oppress workers in every country. They should be repealed and replaced with agreements that respect the rights of workers and their unions, along with enforceable and sustainable environmental protections. Papers For All, Not One More Deportation! Alan Benjamin: Don, Single Payer Now organized a public forum in San Francisco to expose the attacks on Single Payer by both Republicans and Democrats. At your event, you referenced repeatedly a document titled, “Democratic Party Talking Points Provided by the Democratic Congressional Campaign Committee for Candidates to Use to Divert Conversations Away from and Criticize Single Payer.” What is this document and what is its significance? Don Bechler: This document is proof of what many of us have been saying for a couple of decades about the Democratic Party and Single Payer healthcare — namely, that the Democrats always find ways to divert this discussion with language like, “Yes, we support Single Payer, but … we cannot do it because of A, B, C, D, E, F, or G” … and the list keeps going. It’s proof that will help us convince more people to go out and build a massive and independent movement for Single Payer healthcare, or Medicare For All. A.B. : Many people who’ve read this “Talking Points” memo were alarmed. What is your assessment? So they don’t come out and say, “I hate Single Payer”; they say, we need to do all these other things. The second point in the document is the call to “allow more middle class families to qualify for tax breaks to reduce their healthcare costs.” Again, they’re saying something, but it’s not a Single Payer solution. If you are a true healthcare advocate, you want a system that provides healthcare for everybody. You want it to be financed through progressive taxation and be comprehensive, and for everyone to have it, just like public education. If you read their document, you see that we have to do this thing first and that thing first. It’s always, “Yes, but …” It’s always been, “Yes, but …” from the Democrats over the past 25 years that I’ve been working on this issue. A.B. : But there is more than “diverting the conversation” in the Democratic Party’s “Talking Points” document. There is also sharp criticism of Single Payer, taken almost directly from the playbook of the Republican Party. The authors, for example, take issue with the Vermont Single Payer campaign, stating that there is really no viable financing mechanism in a Single Payer plan. Your response? D.B. : The governor in Vermont backed away from his support to Single Payer because he was pressured by the private insurance industries to back off. The largest employer in the state, which is IBM, also put pressure on the governor. As for the financing in Vermont, the authors of the “Talking Points” memo came up with a figure of a 10% increase in the income and business taxes. But that is still cheaper than what you’d be paying now with all the insurance premiums and out-of-pocket costs. There are three bills in play that I am concerned about. One is a California bill called the Healthy California Act (or SB 562). It would save $37 billion a year, which is a lot of money. More important, it provides healthcare for everybody, including undocumented immigrants in the state of California. The other two bills in play are national bills: HR 676 (with more that 100 members of Congress who support it) and SB 1804 (with 15 U.S. Senators who support it). There are pluses and minuses to these two bills: The U.S. Senate bill would override the Hyde Amendment, which prevents women from seeking abortions with federal funds. The other two bills don’t really do that. HR 676 provides for long-term care. The Senate bill does not. But the fundamental thing is that they’re both moving forward with a national health plan that guarantees healthcare for everybody and saves billions of dollars. A.B. : Bernie Sanders made this issue a centerpiece of his campaign. Millions of people came out in support of Single Payer. And yet Bernie got smashed on this issue at the Democratic Party national convention just prior to the 2016 election. Nurses from CNA came back to California and reported that the DNC issued an explicit directive to prevent any discussion about, or any support for, Single Payer at that convention or in the months leading up to the November general election. Why can’t the Democratic Party get behind Single Payer? D.B. : The Democrats, fundamentally, are supporting the 1 percent in this country, and Single Payer runs counter to the interests of the 1 percent. A lot of these people are big donors to the Democratic Party, and they have big investments in the health insurance companies. Here in California Gavin Newsom is running for governor. Some people think he’ll support Single Payer. Maybe yes, maybe no. On occasion he says he does, but it’s usually accompanied by many “buts.” If you look at where his campaign funding is coming from, you will see that he received $922,000 from Blue Shield of California, an insurance company. If he really wanted to show some integrity around Single Payer, he would announce that he is not accepting any money from the health insurance companies. But he is not doing that. A.B. : The AFL-CIO first endorsed Single Payer at its national convention in Pittsburgh in 2009, but it went on to campaign for a “public option” and then for Obama’s Affordable Care Act, pushing Single Payer way into the background. At its most recent convention in St. Louis, the AFL-CIO vowed to be more forceful in its support for Single Payer, but this, again, is not likely given their subordination to the Democratic Party, which, as we have seen with their “Talking Points” memo, does not want to touch Single Payer. What’s it going to take to get Single Payer enacted in this country? D.B. : There are different opinions about this question in the Single Payer movement. 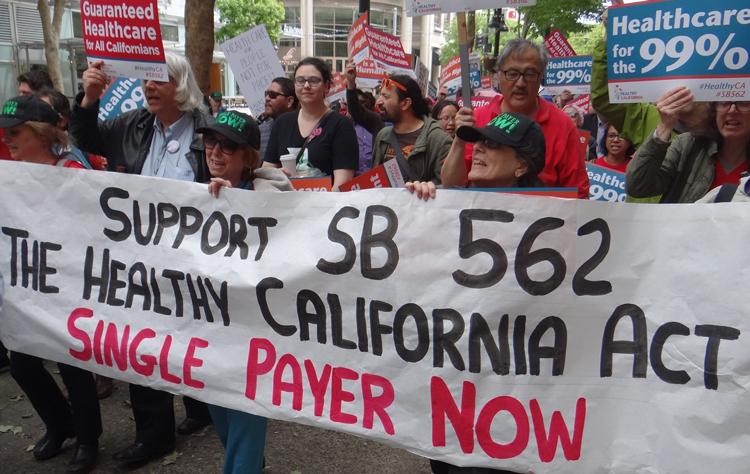 Our organization, Single Payer Now, is dedicated to winning an initiative in California at some point for Single Payer. Our criteria for moving on this is to have 5 million people in a database, so that we can communicate among ourselves and launch a winning campaign. The media are opposed to us. No matter how good our arguments, they come out and find a low-level economist somewhere to say, “This won’t work.” And they give 12 reasons for that. I support people who want to go out to pass Single Payer through the legislatures, though I have less confidence in that. People have a lot of illusions about what we can get done in Sacramento or Washington, DC. My goal is to build an electorate that is solidly Single Payer, where any candidate who says I’m not for it gets booed off the stage. D.B. : Democratic Party politicians are taking advantage of the Single Payer movement. They see it has some energy, because it does at times. So they say, “Hey, I think I’ll support this issue and get some campaign volunteers.” Then later on they take a dive on it. I’m nervous right now about Newsom, and I’m nervous about Ricardo Lara, who sponsored the Senate bill. A.B. : So it’s about building an independent movement for Single Payer that is not beholden to the Democratic Party politicians?